I know this may seem a bit different from what I usually write about here. But I have been a fan of hockey since I was a kid. To this day I am still a fan, and I try to watch every New York Rangers game that I can(which is most of them). My dad was a huge sports fan, and while we watched football, and sometimes baseball, hockey is always the sport I really got into. Like most boys in the eighties, I started out collecting baseball cards. I didn’t really watch much baseball, but I knew who the star players were. When I started to really get into hockey, I started buying packs of hockey cards. Most of the ones I was used to were Score or Pro Set. 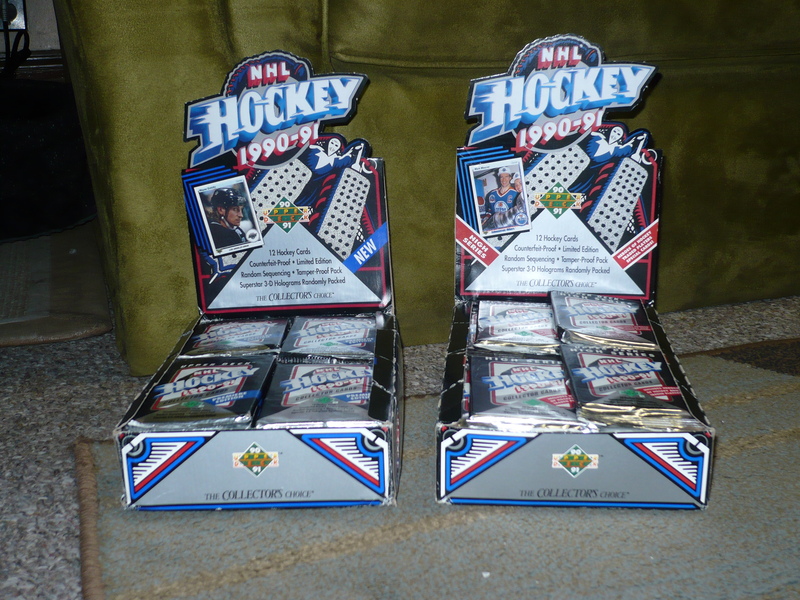 And coincidentally, I started collecting around ’90-’91, and this was the first year Upper Deck had started producing hockey cards. I believe they started manufacturing baseball cards the year before, and it was a success, so they branched out. When these hit the market, they were like no other card out there. 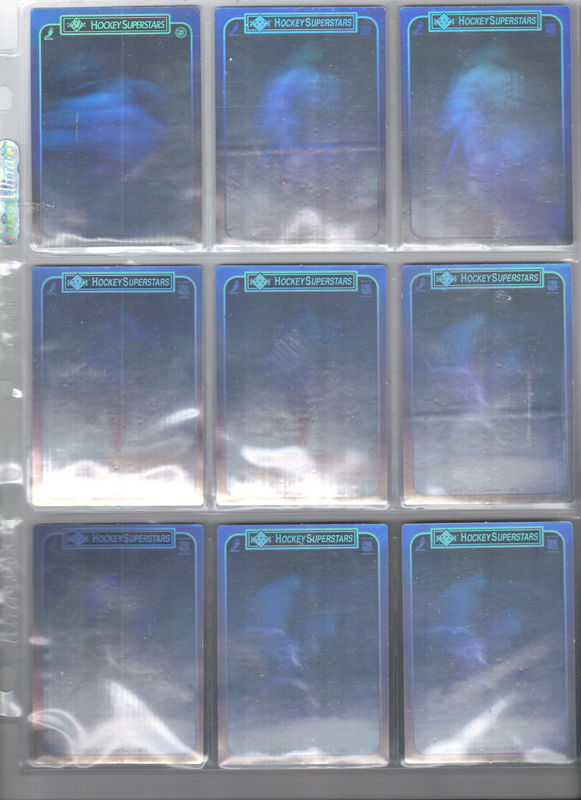 The “counterfeit-proof” hologram on the back, the foil packs. Also, like many other people have pointed out–the photography for these cards was fantastic. I ended up getting 2 factory sealed boxes of these cards. I ordered one, and quite a few packs were all dinged up, so I contacted the seller on Ebay, and he sent me another box free of charge! The only difference was the second box was the high series. The high series is where the more desirable rookies are located. We’ll get to that in a minute. Let’s take a look at some of the cards(these will be more of the “hits” from the box, maybe I’ll do a later post with a greater variety). 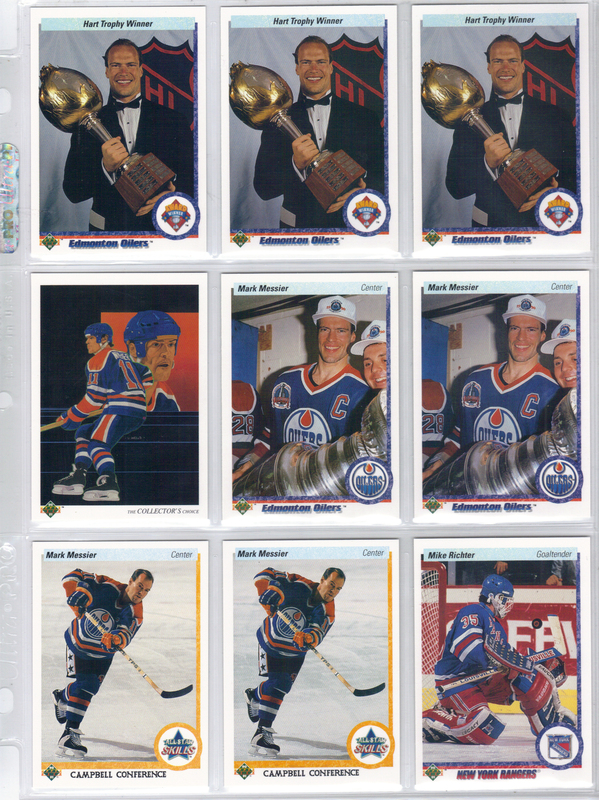 Mark Messier will always be one of may all-time favorite players. Being that I am a Rangers fan, I’m sure you know why. Points-wise, only Wayne Gretzky has more. As you can tell from the Stanley Cup and the Hart Trophy he won, this was in the prime of his career. Rounding out the page is Mike Richter. It’s been some time since I looked at an early nineties Beckett, but I believe this is considered to be one of Richter’s rookies(does that still hold true?). Mario Lemieux was an amazing player, who was hampered by injury throughout his career. Many say, if he was healthy, he would be ahead of Wayne Gretzky on the all-time points and goals list. That could be true, but my younger brother is a Penguins fan, so I had to act like I didn’t like him when we were growing up. But being that he was such a great player, any time I pulled one, card trading definitely worked in my favor. His base card(the one on top), is one card that I have never forgotten. To me, this is just great photography, and that’s why it’s stuck with me after all these years. These days the Young Guns cards are usually sought after cards. These days they’re more limited in numbers, thus commanding more money on the secondary market. These were the ones that started it all. 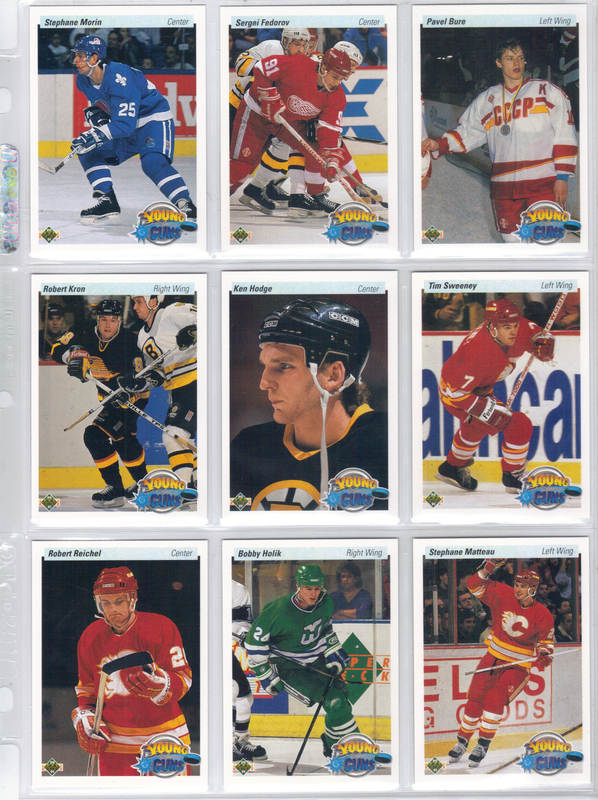 As you can see, I ended up getting one of each of the best ones…Sergei Fedorov and Pave Bure. 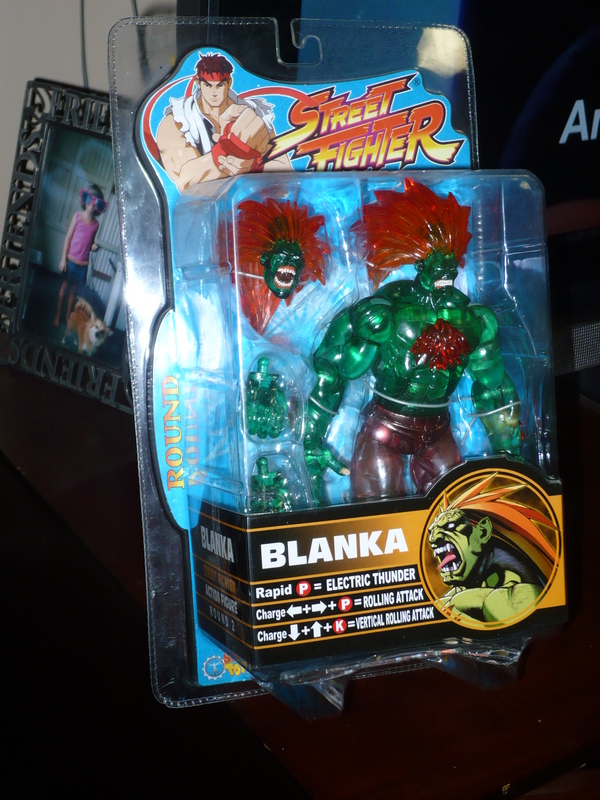 Back in the mid-nineties, these cards were hot! For this set though, I’d say these 2 cards are in the top 3 in the set, as far as value is concerned. The only other rookie in this set that is on par with these 2 is the Jaromir Jagr rookie(of which I did not get a single one, and that was the one I was hoping to get). Even though many of these guys didn’t become super stars, it’s still a nice looking subset. Wayne Gretzky is the NHL’s all-time leader in goals, assists and points. He owns countless records as well, and is the only player in NHL history to have his number retired by the entire league. 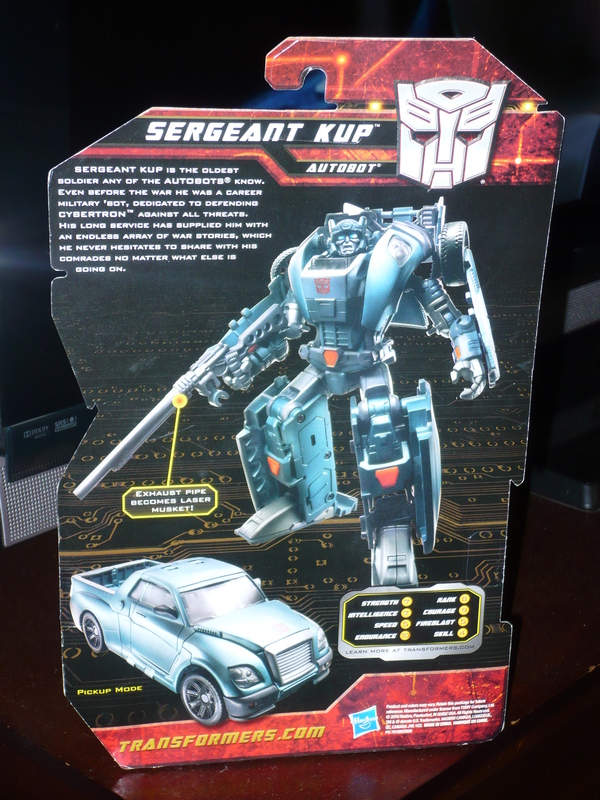 Again, his base card is another from this set that I will always remember. When I got my first copy of this card way back when, it was one of my most cherished cards. As you can see from the awards card, this was another one of the many seasons he led the NHL in scoring. And filling out the page is the only Adam Graves that I managed to pull. 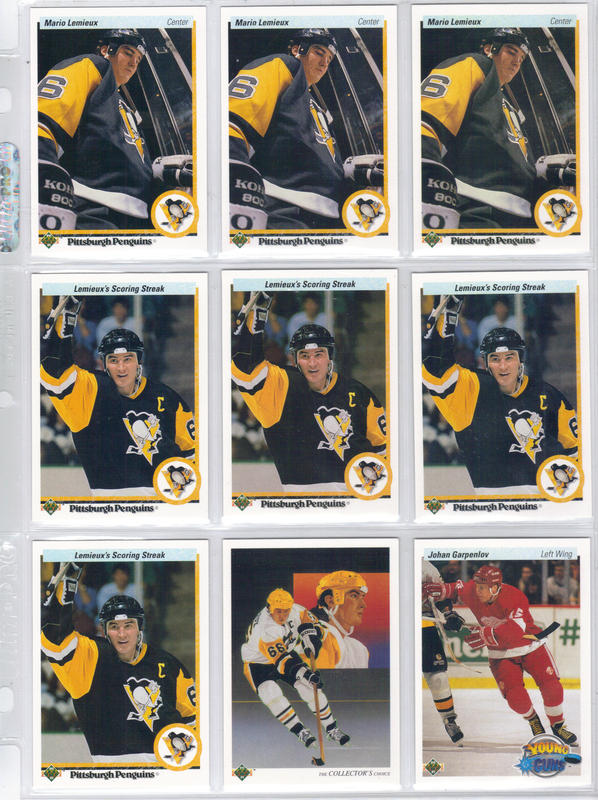 It’s kind of weird that I pulled 8 Lemieux cards and 7 Gretzky cards, but only 1 Graves card. Adam is my all-time favorite player, and like Mark Messier, has his number retired by the Rangers. Lastly, I’d like to show you the inserts that were randomly inserted into packs. These are nothing like the memorabilia and autograph cards(or both on the same card), you see these days. 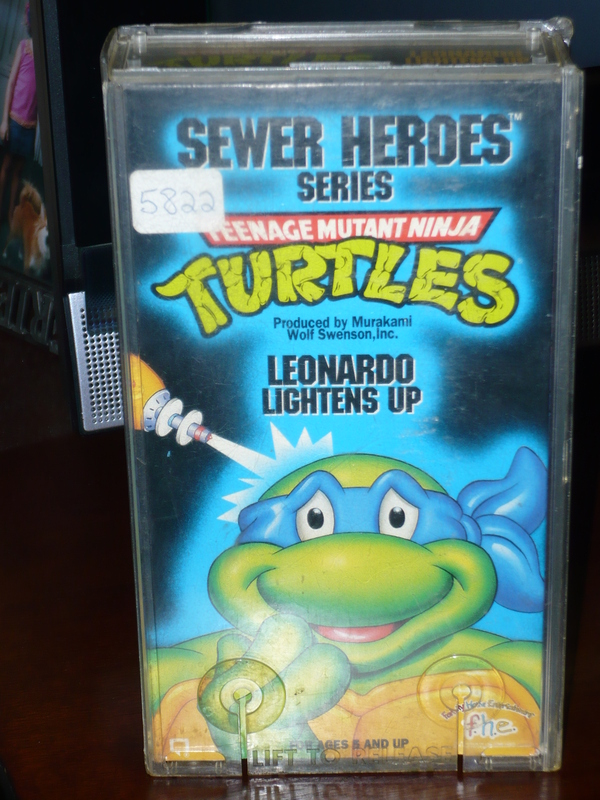 Hell, they’re not even like the countless junk inserts of the mid-to-late nineties. Holograms were a big deal during this time. The only thing is, is that these are horrible! The are blurry and it’s hard to make out who they are. I’ve been able to make out Steve Yzerman, Brett Hull, Mark Messier and Wayne Gretzky. Of the ones I got, there are two with 2 players on them, but I can’t make out who they are. Still, this is a great set, that’s a sentimental favorite of mine. If you’re interested, you can usually score a box on Ebay for about$15-$18 shipped. If you can find them locally, you’ll probably pay about $10 a box. This is one of my favorite pieces from my collection. 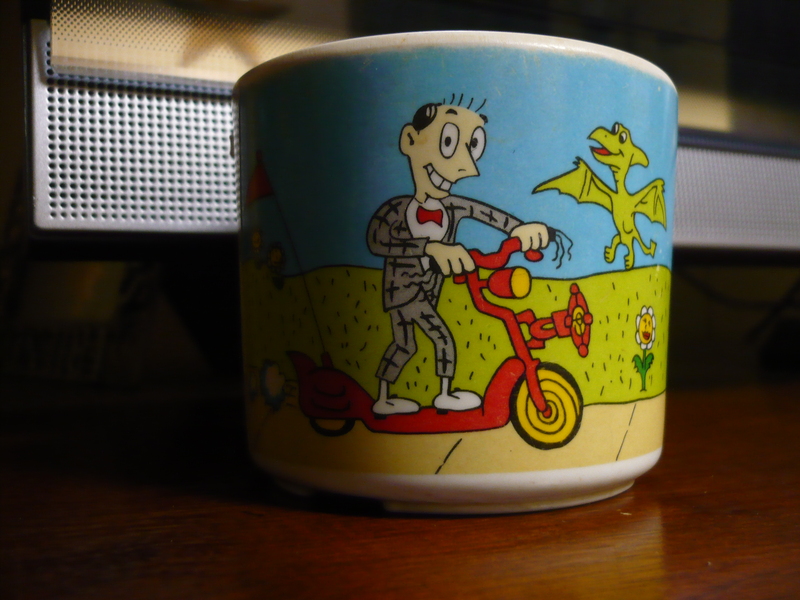 I think I like this more today, than I did when I had it as a kid. I believe the “Super” in their name is attributed more to the size of the toy than anything else. Regular Madballs are about the size of a baseball, and these Super Madballs are much bigger. Touchdown Terror here is slighly smaller than a regular football, and actually works just as well. 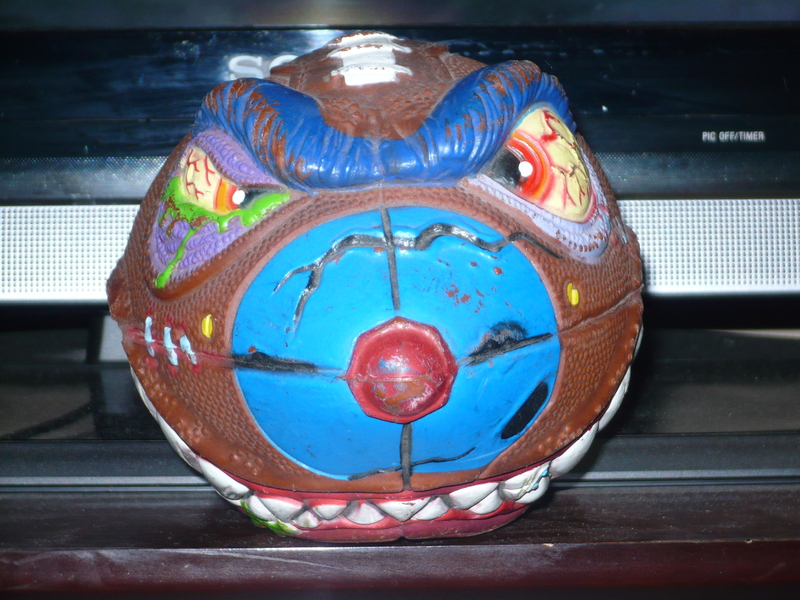 There were two other Super Madballs as well – a soccer ball and a basketball(their names escape me at the moment). 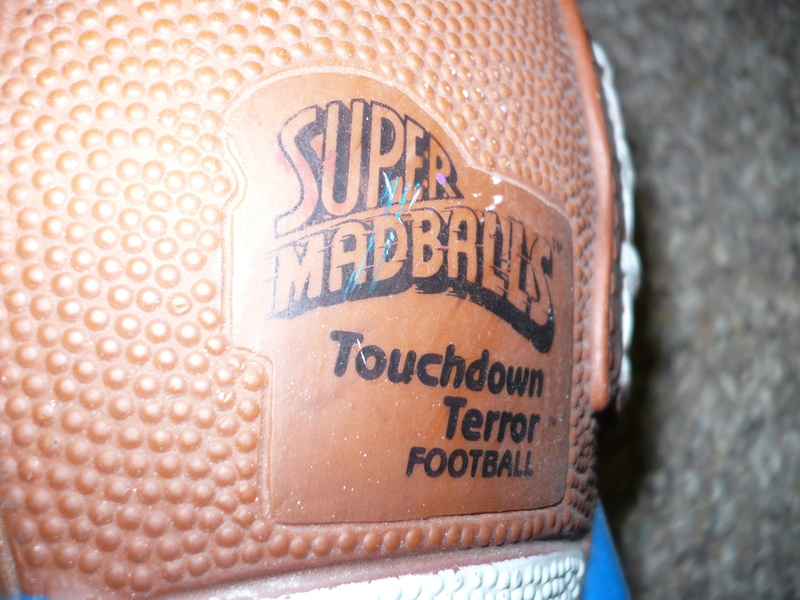 While I do like the original Madballs, Touchdown Terror is my favorite by a longshot. There’s just so much to like about him, the pointy teeth, the green drool, the stitches. Normally you’ll see these listed for $40-$100 on Ebay. 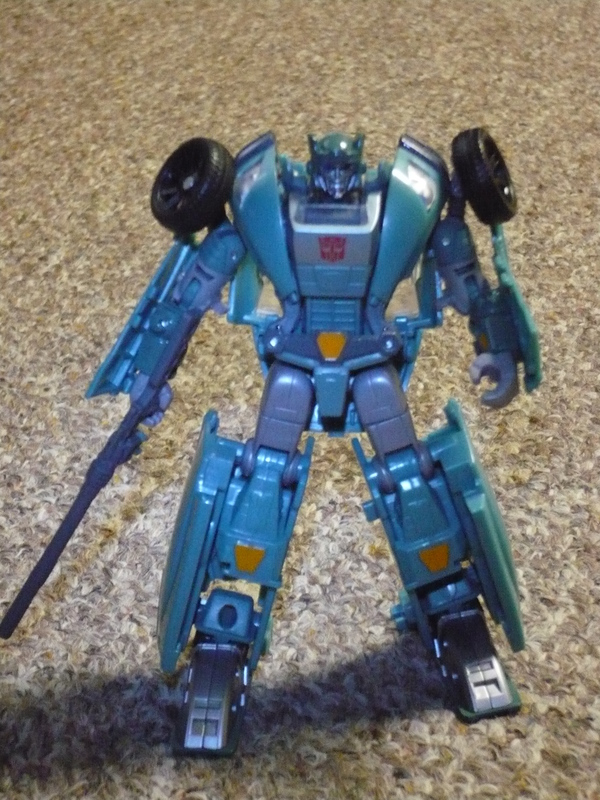 Now, while mine is definitely in played with condition, and pretty scuffed up, I got it for a hell of a deal. 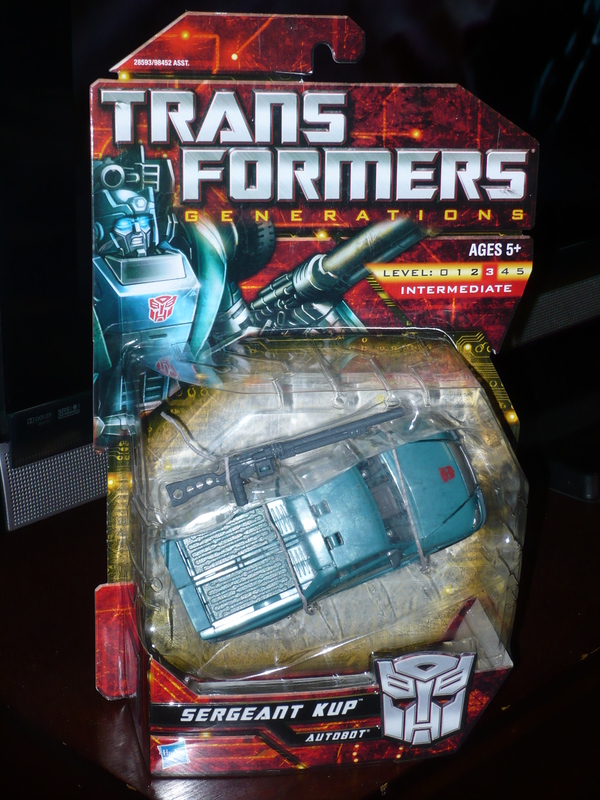 I don’t know how, but it had an opening bid of 99 cents with free shipping, and that’s exactly what I got it for! Sometimes a little bit of luck and patience pays off. I scored(ha! 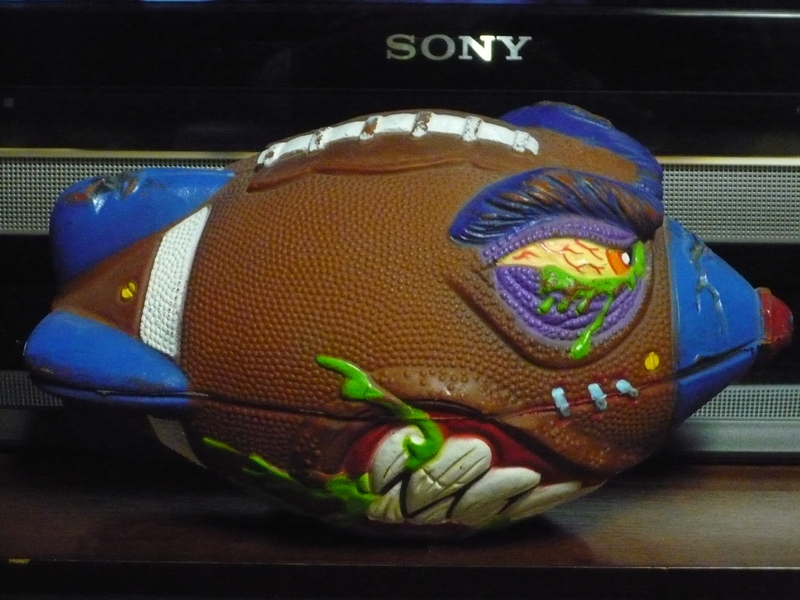 ), this about two and a half years ago and haven’t been able to add anymore Madballs to the collection. The reason for this is because I can’t seem to find any at a reasonable cost(and I’m willing to pay more than 99 cents for them 🙂 ). I have a few MOC figures that I have had for some time. I think this is the one that I’ve had the longest(from the ones that I plan on opening). So this guy has been waiting to be opened since last tax season. 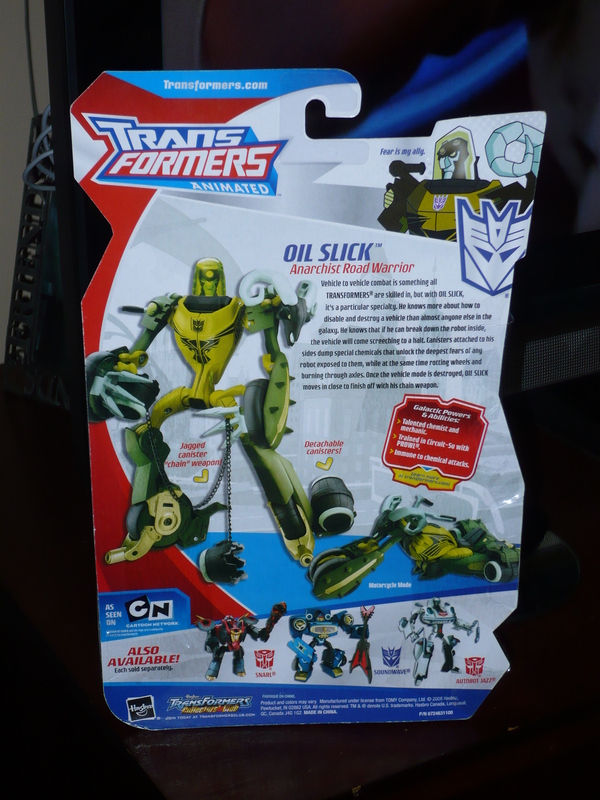 Oil slick here was found at Toys “R” Us on clearance for less than 4 bucks around February or March of last year. 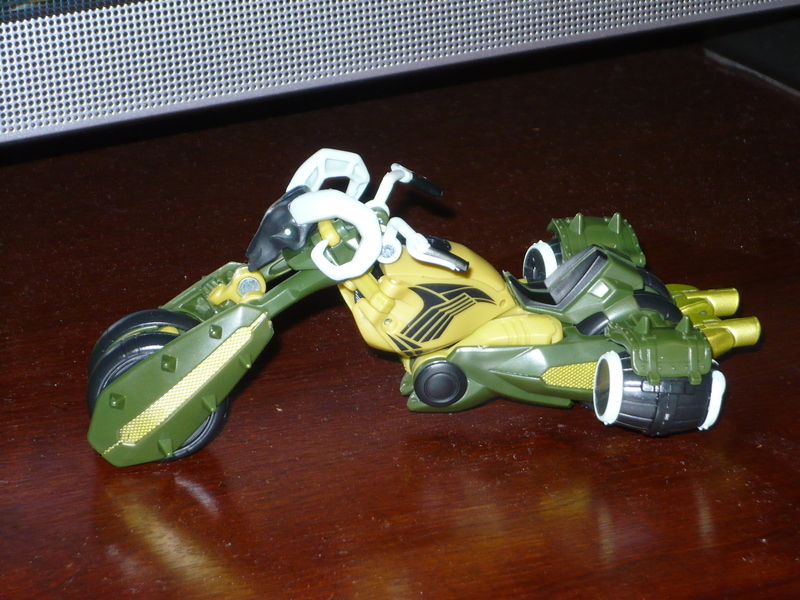 My choices were either Oil Slick(the only one), or Cybertron Mode Ratchet(which there were three of). 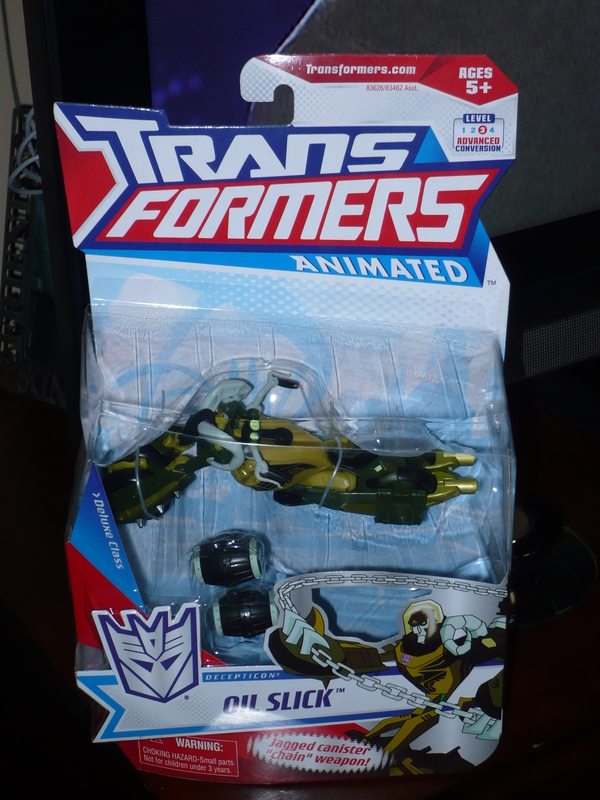 Now, I am a fan of the Transformers Animated style. I was only able to catch a handful of episodes when it was on tv, but the animation style was very pleasing to my eyes. 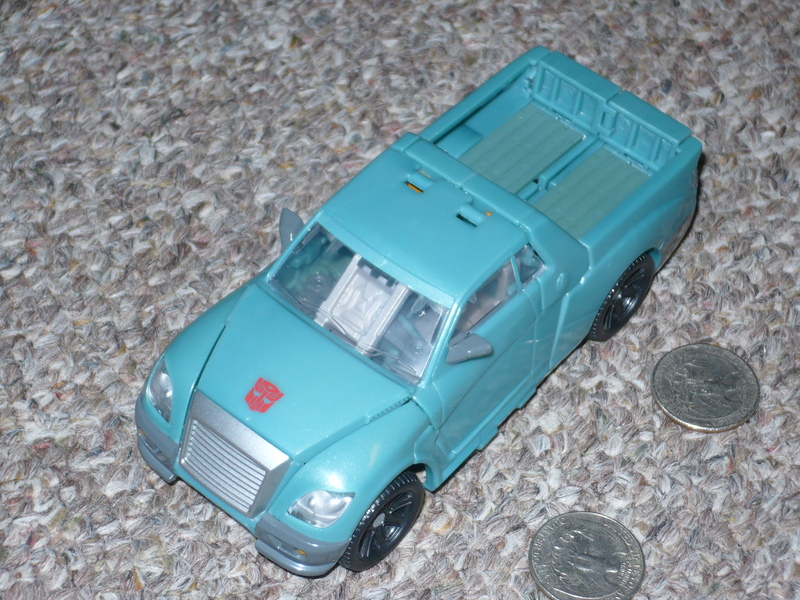 And with these figures, I feel that Hasbro hit their mark in conveying the look into action figure form. I only wish I started buying them sooner, because there are a few more I would really love to have(Starscream, Bulkhead, Blurr, Lugnut etc.). 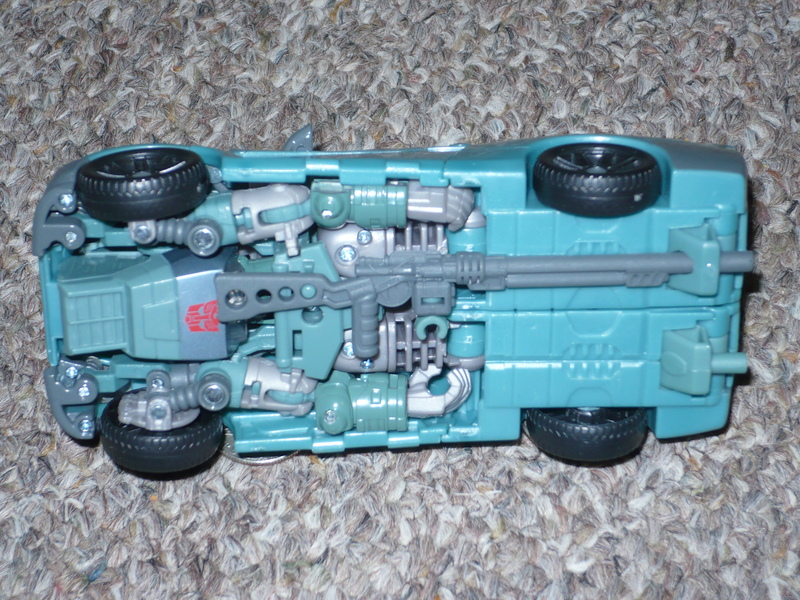 He looks cool in both robot and vehicle mode. The only thing I don’t like is how the front tire doesn’t look like a single tire. But I do like that ram skull that is on the front, as well as the barrels under the saddle bags(the barrels turn into weapons). 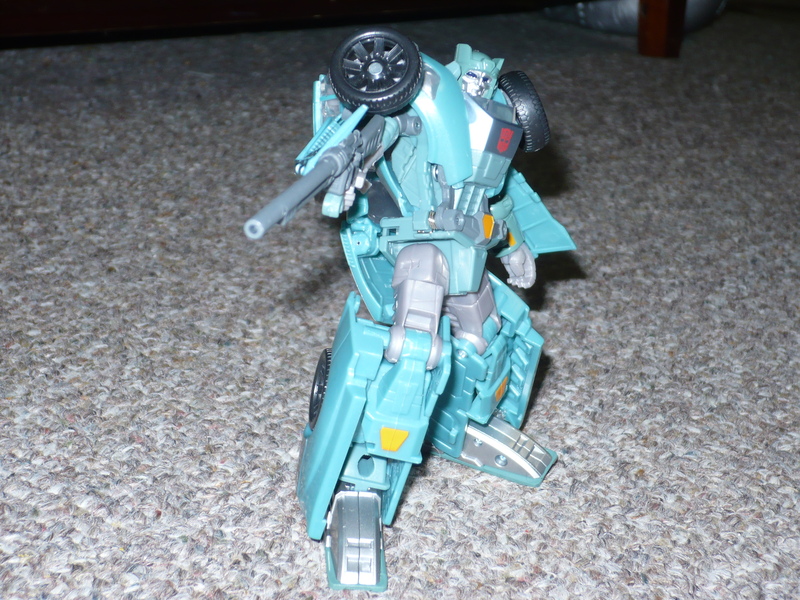 I also like the color scheme, which is reminiscent of military(in color only, not pattern). So there is more right than wrong with this figure. You’ll notice that the chain is not exactly what is pictured on the back of the card. Now I understand that the product may vary from the depiction on the package – – but the chain on the back is black and has many small links. 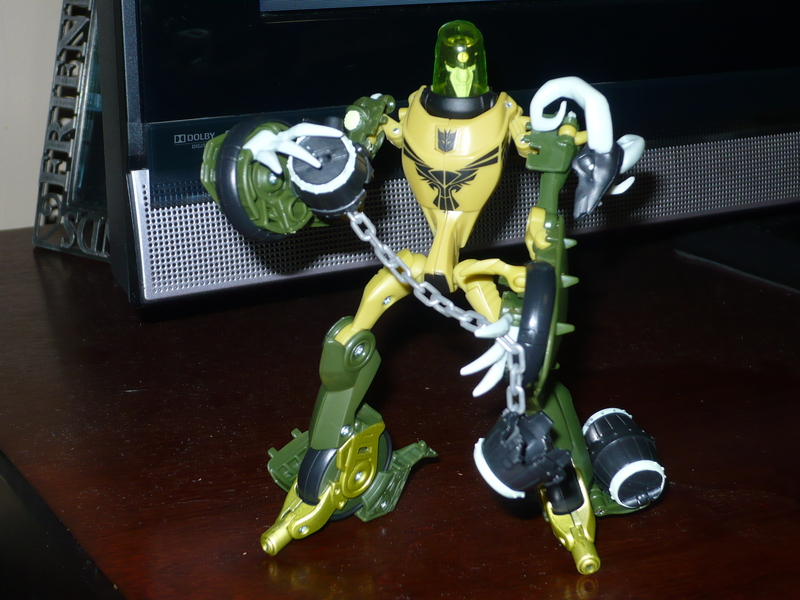 What you actually get is a gray, shorter chain with larger links. This looks terrible when compared to the back of the card(so much better). 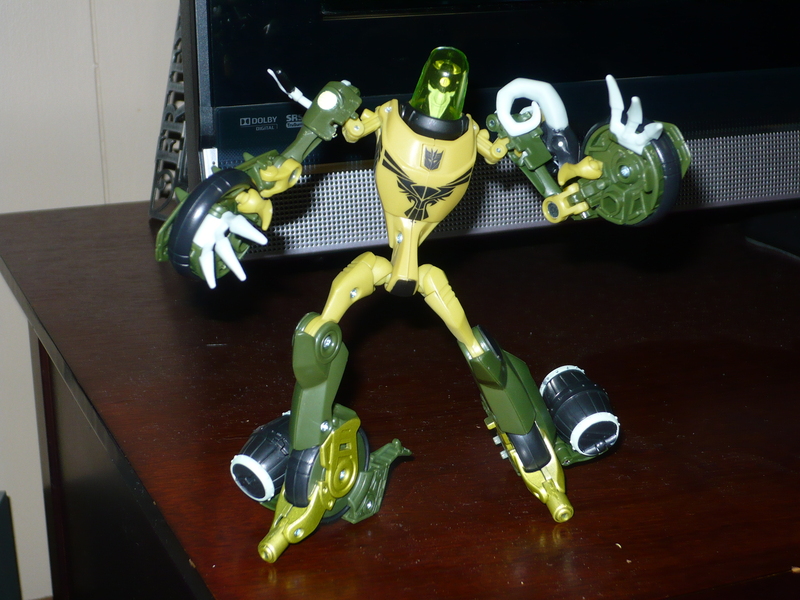 But there was one other reason for buying this figure(besides being a fan of the style), and that is the domed head. I find that to be extremely aesthetically pleasing. There would be only one thing that could make this figure any better…and that’s if the dome was clear, and almost completely filled with green liquid(and if we were in the eighties, it may have very well happened).